The Nassau Treble Choir, led by Director Craig B. Knapp, is a vocal ensemble comprised of students in grades 4-6. Rehearsals focus on healthy vocal production and technique, solfège, sight-singing, and musicianship skills while exploring quality choral literature, authentic singing games, and creative activities. The choir performs unison to 3-part treble repertoire. MYO Children’s Treble Choirs are for unchanged children’s voices. The Nassau Concert Choir, led by Director Doreen Fryling, was formed in the 2006-2007 season. The ensemble is open to students in grades 7 and 8 with unchanged voices and performs music in two to four part harmony. Repertoire is chosen on its musical merit while exposing students to a variety of genres. Rehearsals emphasize proper vocal production and technique, as well as the development of the musical ear. The Nassau Men’s Choir, led by Director James Ludwig, has its inaugural year in the 2019-20 season. The ensemble is open to boys with changing voices in grades 7-10. A major goal of this ensemble is to help adolescent boys develop literacy, musicianship, and technique throughout their voice change. This choir performs repertoire from myriad styles, chosen specifically to fit the developing voices of the young men in the ensemble. The Nassau Symphonic Choir, led by Director Louise O’Hanlon, is a four-part women’s ensemble for high school vocalists. Members are exposed to classical, contemporary, and multicultural music with the goal of fostering an understanding of world cultures. Singing is an intensely personal experience and it is our hope that by making a deep connection with the music, members will, in turn, learn something about themselves and the world at large. As Symphonic Choir comes together to form a community of singers, we can, in turn, form a community of young people who care about each other and who spread joy through their music-making. The Nassau Chamber Chorale, led by Edward P. Norris III, is an ensemble comprising of Nassau County’s finest high school vocal musicians. Members of the Chorale have also performed with the All-County Choirs, All-State Choirs, All Eastern Choir and the ACDA National Choir. This is a select group of approximately 40 singers that perform some of the world’s finest choral literature; from the classics to contemporary (NYSSMA level 6 and beyond). The musicians in this group are advanced performers and have mastered the vocal skills necessary to be outstanding choral singers. Many of our members go on to study music in college. The Suffolk Treble Choir, led by Director Craig B. Knapp, debuted in 2008 as a 4th-8th grade vocal ensemble and it is now comprised of students in grades 4-6. Rehearsals focus on healthy vocal production and technique, solfège, sight-singing, and musicianship skills while exploring quality choral literature, authentic singing games, and creative activities. The choir performs unison to 3-part treble repertoire. MYO Children’s Treble Choirs are for unchanged children’s voices. The Suffolk Concert Choir, led by Director Melanie Dominick, was formed in the 2012-13 season. The ensemble is open to students in grades 7 and 8 with unchanged voices and performs music in two to four part harmony. Repertoire is chosen on its musical merit while exposing students to a variety of genres. Rehearsals emphasize proper vocal production and technique, as well as the development of the musical ear. The Suffolk Women’s Choir, led by Director Brad Drinkwater, is a four-part SSAA ensemble for high school vocalists. 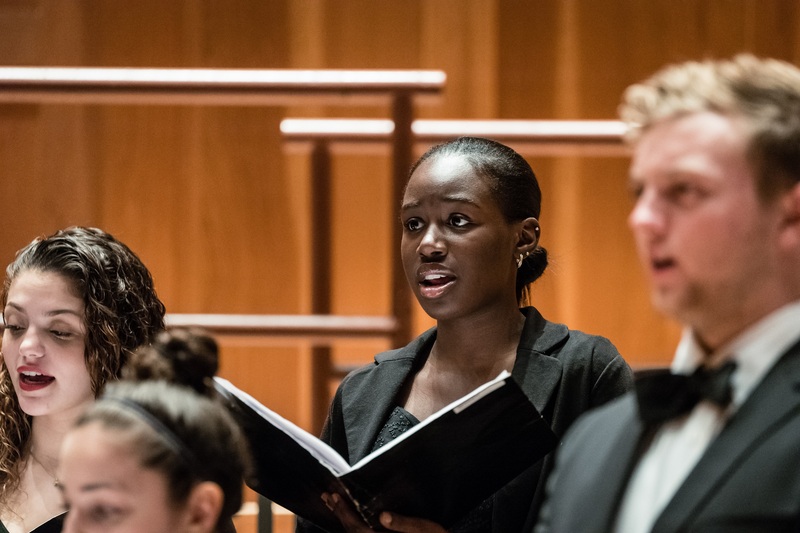 Newly formed for the 2019-2020 season, the Choir performs advanced classical and contemporary choral music written for women’s voices. Through inspired and joyful singing, it is our goal for both singers and audience members to experience the full transformative power of choral music. Singers in this group should have experience singing in choirs and be able to demonstrate appropriate vocal technique and tone quality. The Suffolk Symphonic Choir (formerly the Suffolk Youth Chorale), led by Director Shoshana Hershkowitz, is a mixed choir that debuted in the 2013-2014 season. The ensemble performs a wide variety of choral literature that spans many cultures, styles, and time periods. Singers in the ensemble should be of high school age and have experience singing in school choirs and at NYSSMA solo festivals.